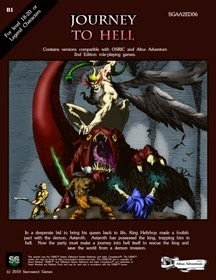 I picked up a few PDFs over the last couple of weeks for ideas for my big 5e game. The rule system is 5e, but the adventures themselves are all 1st ed or Basic. In the process I noticed that I had picked up a few titles from Sacrosanct Games and I thought I would share what I found. This one grabbed this because I needed an adventure geared toward 18-20th level. Also it is about Hell, so that got my attention. I bought it on a whim based solely on level and "hell". First off you get a lot of adventure for your buck. 45 pages of adventures and maps (granted it is the same adventure twice, but still). The artwork is great, coming primarily from sources like The Inferno. This is quite fitting given that the adventure itself is quite reminiscent of Dante's great tale. It does include some art from the Larry Elmore CD that was out years ago, but doesn't properly cite it in their OGL page. It is dual stated for the OSRIC and Altus Adventum Role-Playing Game, always a plus in my book, but it can be played with any number of OSR systems or their fore-bearers. Grabbed this because my youngest wants to play a ninja like character. It has a ninja, as well as a monk, a mahoutsukai (spell caster that uses both magic user and cleric spells, and a lot of them), and the yokai which is a race as a class of animalistic humanoids, and of course the Samurai. Weapons are listed (damage and cost) but no descriptions are given and no artwork of the weapons. And that is pretty much it. If you don't know what these weapons look like, then you are on your own really. Looking over the mahoutsukai it is grossly overpowered. It basically advances as cleric and a magic user at the same time. So by 14th level it has 12 each of 1st through 5th level spells, 7 6th level and 1 7th level. It has limits, namely limited to the same arms and armor choices as a magic-user, limited to 14th level and can't turn undead. But that is still a lot of spells. Honestly it should one spell list that combines select magic-user and cleric spells and it should have some limits on what it can and cannot do. Right now it is not a class I can recommend using. I picked this up because I do enjoy seeing what others can do with such well trodden ground as the Keep and the Caves of Chaos. 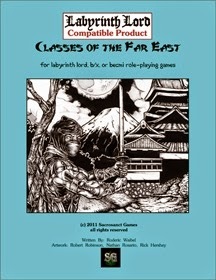 The cover claims to be 5th Edition compatible and uses the current OGL to get there. Personally if I were a publisher I would be staying away from this. It is murky legal ground right now and one I would not tread on. But lets move on. The cover is nice and drew me in right away. The book is 24 pages, but minus 1 for cover, 1 for ogl, 1 for a blank page, 1 for an ad, 4 for maps and 1 more for a character sheet. So 15 pages of text. 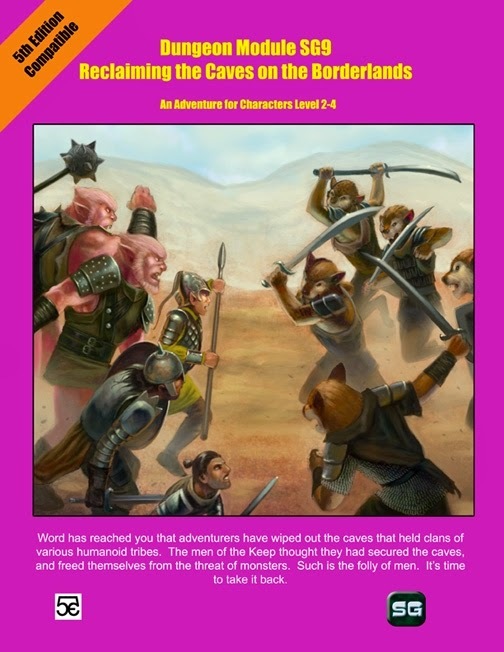 The Good: There is a good section on pages 4 and 5 on playing humanoid races such as orcs, bugbears, gnolls and so on. Just the stats, nothing really on "how to play them" No big, these are the standard baddies for the last 40 years. We know them. There is detail on how the caves are controlled and what can be the expected losses of the various groups of humanoids living in the caves over time. The Not As Good For Me: The caves and the rooms themselves are not detailed. There are blanks left for the DM to write in what is there from monsters to items. The main conceit here is that the inhabitants of the Keep have taken over the Caves now. It is all very sandboxy which is fine, but not what I was expecting. I am perfectly fine with sandboxes, but that it not why I buy pdfs. I buy graph paper for that. The Bad: This PDF uses scanned images from the original map of the Caves of Chaos from B2. It has been run through Photoshop and some alterations have been made, but I can overlay a scan of the blue/white Caves map and line it up perfectly (including grids) to the "Reclaiming" maps. Not very professional at all. The Ugly: Additionally there is a really bad scan of the old D&D Basic era Character sheet. It has been edited (poorly) to make it more in line with 5th Edition, but honestly it is just plain ugly. The artist would have been better off starting from scratch and making a 5e sheet that looked a bit like the Basic one rather than include this. Better still would be not to include one at all. It is just ugly, shows really poor Photoshop skills and a copyright infringement to boot. So in the end, despite some promise and high hopes, this falls really flat.